“Honey-Coloured Moon.” Words by Desmond Carter, music by Mabel Wayne. Composed for the British film Music Hath Charms (1935). Recorded by Elsie Carlisle with orchestral accompaniment on November 29, 1935. Decca F. 5818 mx. GB7527-1. “Honey-Coloured Moon” was introduced in the 1935 British film Music Hath Charms. This movie appears to have consisted primarily of vignettes loosely held together by the fact that the various characters all listen to the BBC Dance Orchestra. In one scene, a woman in a parlor room begins to sing “Honey-Coloured Moon,” but the action suddenly changes to a broadcast studio, where Henry Hall is directing his orchestra and American cabaret singer Hildegarde is doing the singing. There is a quick transition to a cruise ship as the band plays on, followed by a courtroom scene, where the judge, lawyers, and jury all seem to be taking a break from serious matters by listening to Hildegarde on the radio. When two people apparently opposed to one another in the lawsuit begin to spoon, the case is dismissed. The words of “Honey-Coloured Moon” convey a recollection of the beginning of a romantic relationship with its attendant circumstances: sea and moonlight. 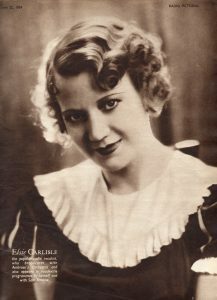 Elsie Carlisle brings to this song a mellifluous vocal sweetness to match its entrancing lyrics. It is worth comparing this recording to other Mabel Wayne songs that Elsie recorded in 1934-1935 (“Little Man, You’ve Had a Busy Day”; “Who Made Little Boy Blue”; “His Majesty the Baby”). There is a similar sentimentality in all of these Wayne compositions that almost requires Elsie’s vocal style, insofar as she can deliver the tone of sincerity that makes listeners withhold judgment. With “Honey-Coloured Moon,” it is vital that the audience get honey and not treacle, and Elsie delivers. 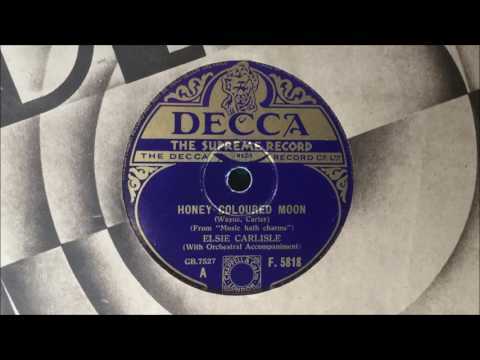 Other versions of “Honey-Coloured Moon” were recorded in Britain in 1935 by the BBC Dance Orchestra (under the musical direction of Henry Hall, with vocals by Hildegarde, in a Ben Frankel arrangement), Maurice Winnick and His Orchestra (with vocals by Sam Costa), Jay Wilbur and His Band (vocalist Gerry Fitzgerald), the New Mayfair Dance Orchestra (directed by Carroll Gibbons, with vocalist Brian Lawrance), Tommy Kinsman and His Band, Lou Preager and His Romano’s Restaurant Dance Orchestra (with singer Ronnie Hill), and Billy Cotton and His Band (with vocals by Alan Breeze).